Her outlandish costumes often get more attention than her music but Lady Gaga proved that she is the leading lady of pop, sweeping the MTV Video Music Awards with eight trophies including the one for Best Video. 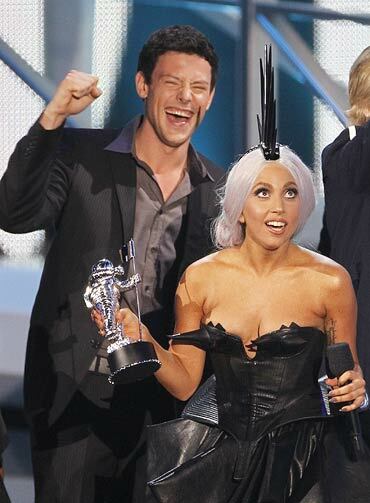 The 24-year-old's Bad Romance won her the gong for the Best Video and Gaga made sure that all eyes were on her with elaborate costume changes, but teared up while accepting the trophies called moon walkers. "I was so nervous tonight that I'd let my fans down. I promised if I won I'd announce the name of my record," she said accepting the top award. She then revealed the name of her upcoming album, 'Born this way' and sang part of the title song. Gaga, whose prizes also included Best Pop Video, Best Female Video and Best Collaboration, thanked her fans whom she calls "little monsters." "Tonight, little monsters, we're the cool kids at the party," she said. Gaga made her entry in a flowing Alexander McQueen design, comprised of gold, orange and green with a renaissance-style art print on the front. She teamed the outfit, which she wore for a recent Vanity Fair cover photoshoot, with a long white wig complete with gold-feathered headdress and was accompanied by a military-themed entourage. During the ceremony she made two more changes, wearing another design by the late McQueen, a flowing black number, before finishing off with her dress made out of red meat. The other big winner at the MTV Video Music Awards was rapper Eminem, who picked up Best Hip Hop Video and Best Male Video and opened the live televised show with a performance of his winning song, Not Afraid. 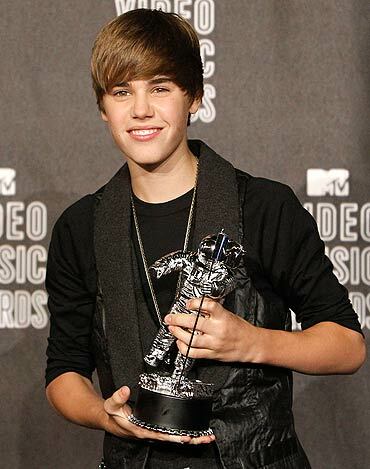 Among the male performers, another notable success was teen sensation Justin Bieber, who won Best New Artist after arriving at the theater pursued by screaming teenage girls. "This means a lot to my family. I come from a little town in Canada, I never thought I'd be in this position," Bieber said. No less gripping for music watchers were the appearances of the protagonists in last year's most memorable VMAs moment, when Kanye West shocked viewers by rudely sabotaging country sensation Taylor Swift's award acceptance speech. Although they didn't meet on stage again, Swift sang what was quickly interpreted as an acceptance of Kanye's repeated apologies. "You're still an innocent. Thirty two and still growing up now. Who you are is not what you did," she sang in the gentle song. Padma Lakshmi turns 40, Moulin Rouge-style!